Publisher Nightdive gives an update on the game's progress. Last year, Andy brought you the news that remasters of Turok: Dinosaur Hunter and Turok 2: Seeds of Evil were in works. That first once has since come out, but we're heard squat about its sequel since. 'Maybe it was cancelled' is not an unreasonable conclusion to come to, but that conclusion has just been proven wrong. Daniel from publisher Nightdive Studios has taken to Turok's Steam page to assure fans that "Turok 2 is coming", while noting that they'll only release the game "when it's done". The delay, or at least the lack of development transparency, appears to be down to contractual obligations/issues to do with the rights, but at least the game is being worked on, if privately. "So as many of you may have guessed," the Steam post reads, "working on the rights to these classic titles can be tricky and sometimes contractual obligations prevents the transparency we've enjoyed on some of our other titles which is why updates have been mysteriously absent. 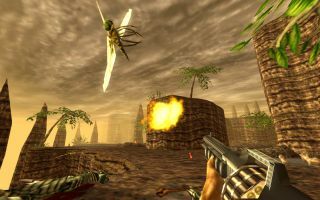 "We're well aware of the demand for Turok 2 and it is still in development...in fact we started development just shortly after the launch of the first Turok. Turok 2 is a bigger game, more enemies, more weapons, more locations and most importantly...Turok 2 had Multiplayer. You heard the man: Turok 2 is coming. At some point.